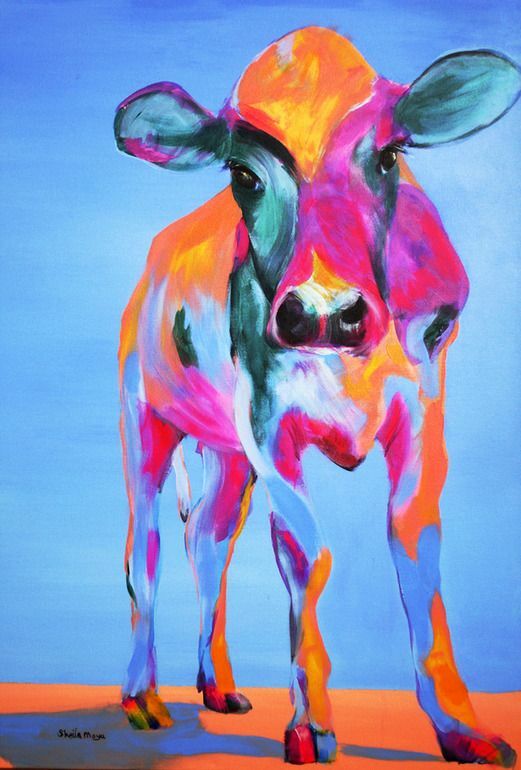 This lovely cow image came from saatchionline.com. I love the colours chosen here. Lately I have not wanted to eat meat. I am known for being a bit of a fussy eater and meat is currently on the “don’t want to eat it” list. Back to meat. There seems to be a current trend, perhaps ongoing, that some people just randomly develop an aversion to meat. Now I have never been a massive meat eater, although I was raised on a very typical diet of meat and vegetables, and traditional type fare. I always felt perfectly fine about it all, and enjoyed my meals. I guess I didn’t become the fussy eater I am as such until I reached adulthood, where I was no longer forced to consume what was put in front of me. Even though it was great, my parents were good eaters, healthy, lots of vegetables and square meals no snacking type people. They were excellent role models, thanks Mum and Dad. I dated a farmer once. I never ate so much meat in all my life. We would literally snack on silverside for a Sunday night meal. Seriously, it was out of control. I was skinny though. High protein diet did work for me at the time, but I don’t think I felt all that healthy on the inside for it? It’s hard to remember really. I used to consider myself a white meat eater. Fish and chicken were more my thing, but lately I am perusing the vegetarian side of the menu and exploring weird patties and meat alternatives. And I like it. It works for me, and for some weird reason I just don’t feel like eating meat. There is some word out that we are raising our energy awareness and cutting out meat seems to be a natural progression in this direction. Some of my friends have had the same experience. I have always loved animals too, and have never felt that great about consuming them. 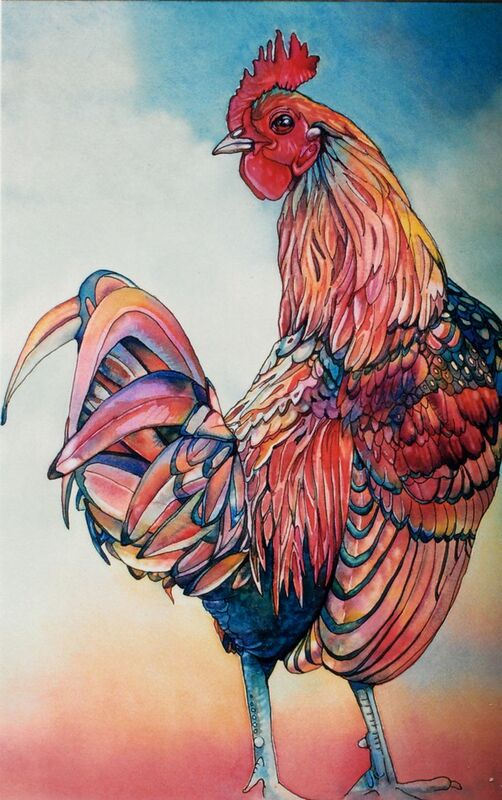 This lovely chicken came from jeannievodden.com I really love the colours chosen here and the interesting way it has been drawn. There really are so many talented artists out there! I am interested to know if you too have changed your consumption of meat over the last year or so. It really is quite peculiar, but I think it is important to listen to your body and feed it what it wants. Now I don’t mean eating lots of chocolate and buttery toast, even if it does taste good! More about being more aware of what we are consuming to feel good, to operate well, and to go about our day to day lives with more energy, enthusiasm and direction. Are you a vegetarian? Are you a phase eater? Talk to me! It’s the veggie life for me, 8 years . Thats great!! Do you feel much better for it? I think so. I have read that people can develop B-12 deficiency but I think I manage well with a wide range of vegetables, beans etc. I’ve tried vegan on and off but that’s a bit of a struggle for me at the moment. Well do what your body wants I say! I have gone off cheese and eggs lately too. I never drink milk, but I do like yoghurt still. Thats about it for dairy… why is eating vegan hard for you? I’ve been Vegetarian for close to 3 years now, and I must say that it now feels unnatural to eat meat. Surprisingly, I’ve felt healthier. I have just gone off it all together. I agree, I feel better for it too. Good on you! I was a vegetarian for about a year and felt really well (I think I paid more attention to what I eat), but I started eating meat again during my 2nd pregnancy (don’t think I could function well without it). I’m eating less and less meat nowadays, specially on the hot days, but I don’t think I’ll go back to completely vegetarian diet. I am kind of the same… I like a meat free diet but don’t want to completely eliminate it. I never eat red meat so if I do eat meat its chicken or fish, and I think that is totally fine. Its good to listen to your body and respond with what it needs. Pregnancy is a fine example of that! I love a good food craving pregnancy story. I always find them so interesting!